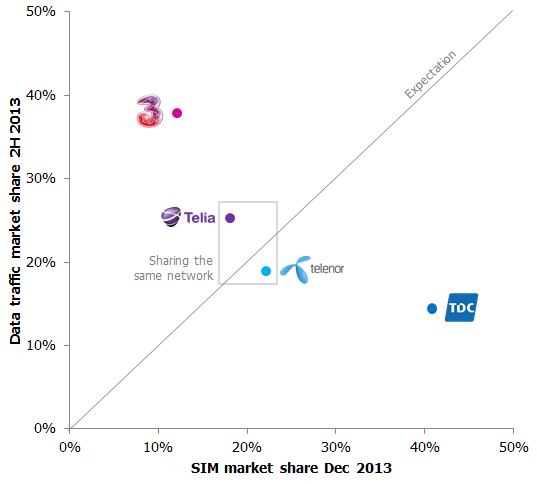 Telenor and ‘3’ sell more equipment than Telia and Tele2 – or? TeliaSonera started to separate out equipment revenue in their new reporting format. Lovely! We can now compare the equipment revenue vs. mobile revenue ratio for all Swedish operators (see graph). According to reporting notes, Telenor and ‘3’ realise the full equipment price as equipment revenue and let the equipment subsidy dilute service revenue instead. 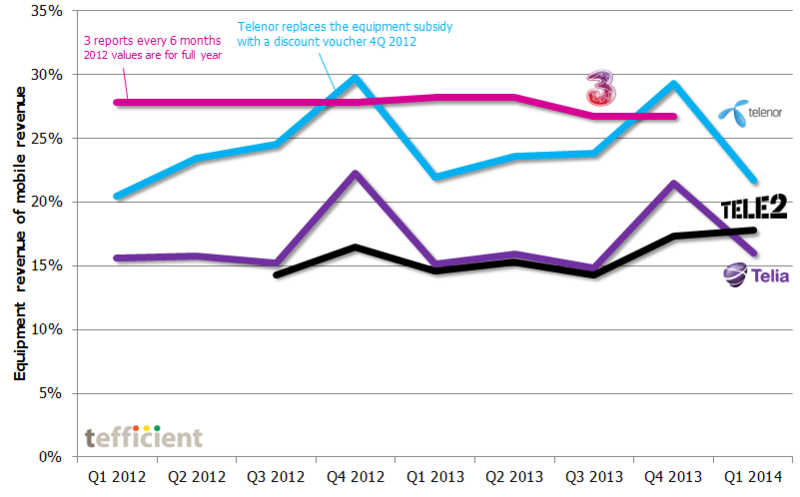 Telia and Tele2 realise the actual equipment sales price after subsidy as equipment revenue. Active in the same market, there is likely no material difference between the equipment sales of the operators; the differences between Telenor/’3′ on one side and Telia/Tele2 on the other are rather a consequence of the revenue recognition used. If so, we can by comparing these two approaches estimate that Swedish operators averagely subsidise around one third of the nominal equipment price. That is how much Telia and Tele2’s lines would have to be raised to match the lines of Telenor and ‘3’. A1, the Austrian incumbent, today reports a year-on-year EBITDA decrease of 19.4% for 2013. In this situation, you have to highlight the positives. Telekom Austria group is e.g. saying: “A1 Premium Monthly Churn Rate at Historic Low“. By now, our industry should have learned that churn figures never can be referred to without also referring to the subscriber retention cost (SRC). It’s simple to decrease postpaid churn – if you have deep pockets: Pay higher SRC to get more customers to stay. 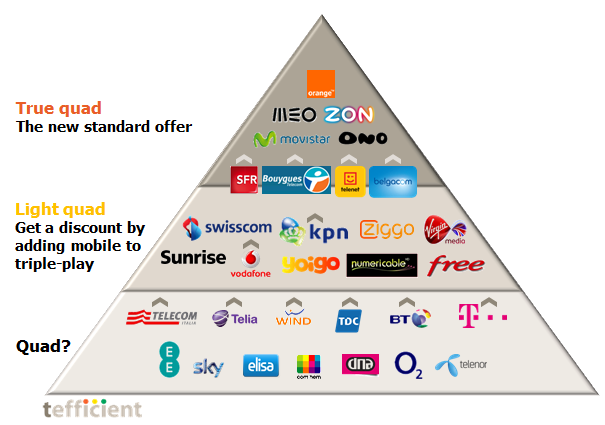 So since Telekom Austria hasn’t done it – let us plot postpaid churn against SRC. It’s the graph below. In 2013, A1 has been able to reduce postpaid churn to below 10% on annual basis which – internationally compared – is very low. 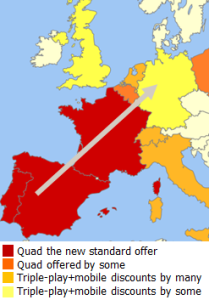 But starting Q4 2012, A1’s SRC elevated from around 140 EUR to about 170 EUR. This happened at the same time as smartphone price points started to come down which, in other markets, was positive for SRC. The reason to A1’s increase must therefore be found in the local market: In January 2013, ‘3’ incorporated Orange to become a strong number 3 in Austria. 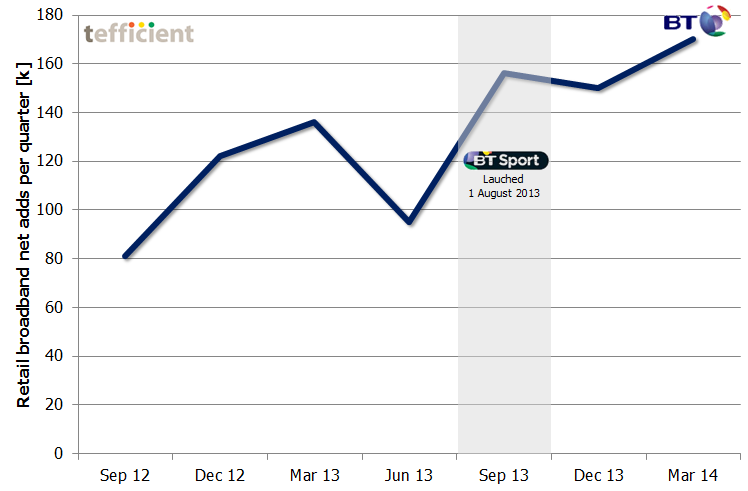 But how good is A1’s churn rate? 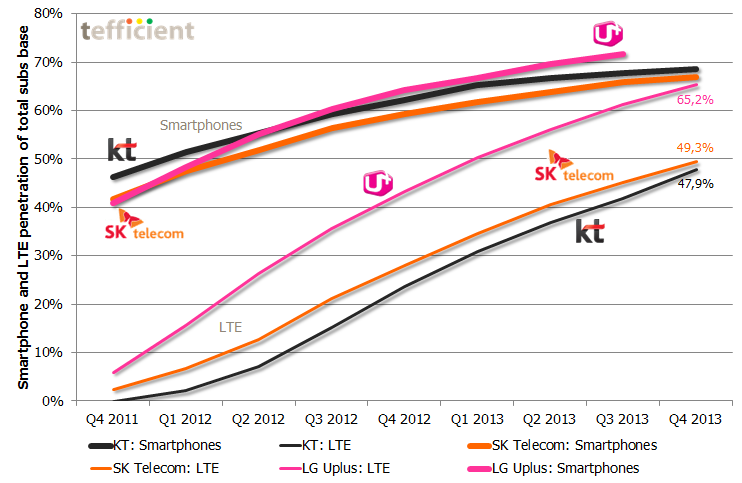 If we plot the figures of T-Mobile and ‘3’ into the graph just above, we can see that competitors report as low churn as A1. (Prior to adding Orange, ‘3’ was even at annual churn levels below 3%). 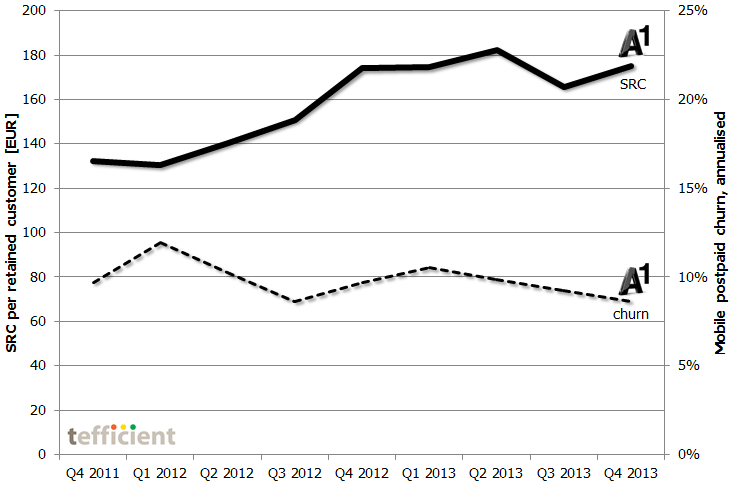 T-Mobile has followed A1’s SRC upwards, but from a lower level. In a local perspective, A1’s achievements seem in line or even substandard. Note. 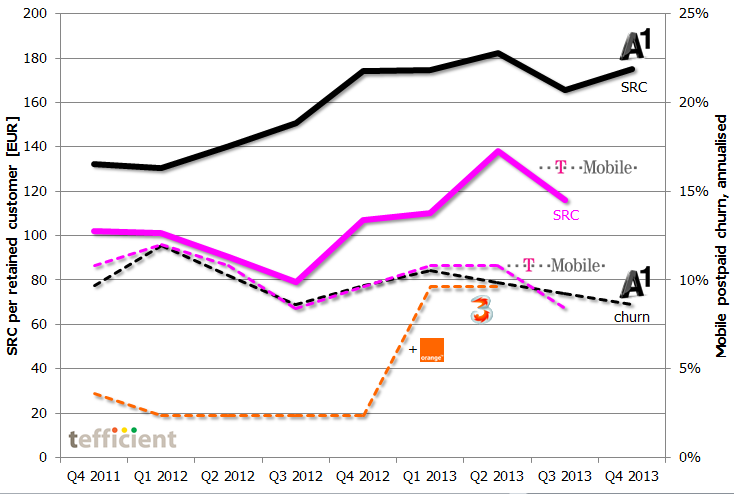 T-Mobile and ‘3’ have not yet reported Q4/2H 2013. ‘3’ doesn’t report SRC. Will ad-funded mobile fly this time? The question is if Swedish ad-funded MVNO Wifog – launched yesterday – can make a similar concept fly. Wifog has realised that in 2013, people spend most of their device-interaction time connected to the Internet. Their proposition is therefore data-centric: Watch 2-5 minutes of video adverts a day (you can schedule these) and in return get unlimited data (on 3’s 3G network), 120 minutes of voice and 200 SMSs per month. Wifog tells advertisers that they can reach the right audience – through targeting and analytics. It’s likely that Wifog’s users will be profiled based on what they use the Internet for – much more powerful than the orginal Blyk concept which was based on end-users selecting their “areas of interest”. The question is just how interesting this is for advertisers in a world where Google – without asking for our opt-in consent – already targets us with device-specific, location-specific and usage-based adverts.